Don’t get excited, it happened four weeks ago and didn’t change much, though it was fun to watch. I mentioned in Sugared Bees, Anyone? that we found supercedure cells (emergency queen cells) in Buzz, so is that where the swarm came from? What I witnessed weeks ago was an energetic and buzzy bunch of bees vacating the hive in droves, wings vibrating and roaring, and bees filling the air. 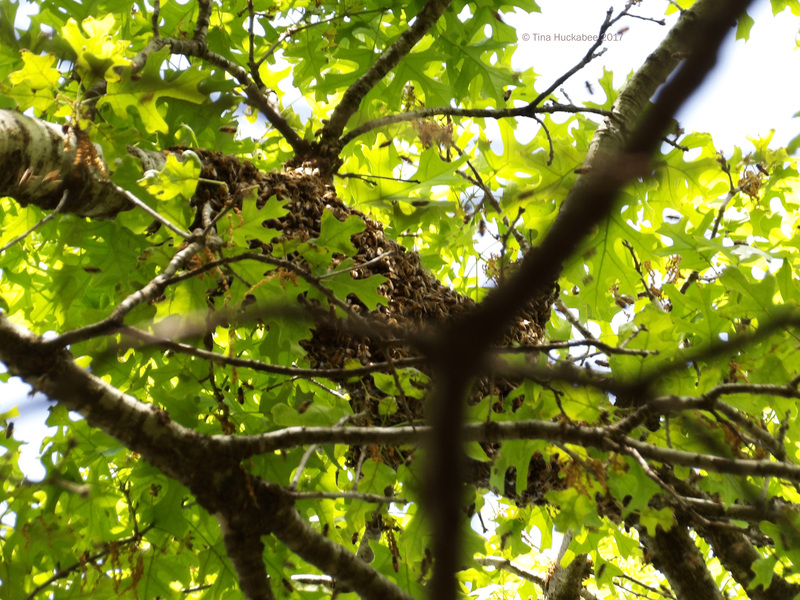 Within a few minutes, the bees clamored around a limb of the Red oak tree under which Buzz resides, where they clustered together with a measure of calm and quiet for about 20 minutes. …and eventually, crawling back into the hive. 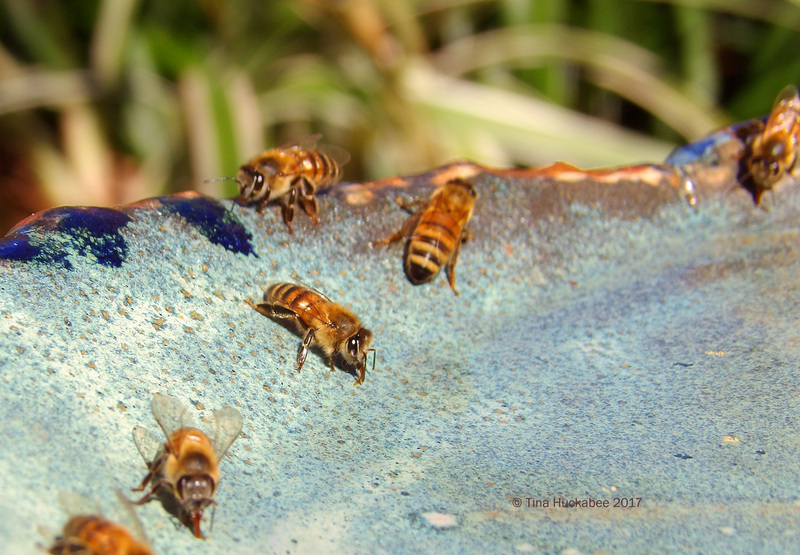 The whole event, from the first mass of bees leaving the hive, to stragglers marching back in, lasted about an hour. It was awesome! But was it a swarm? The bees left the hive in swarm-like fashion, but returned to their home base. I think that’s a honeybee hive procreation non-starter. 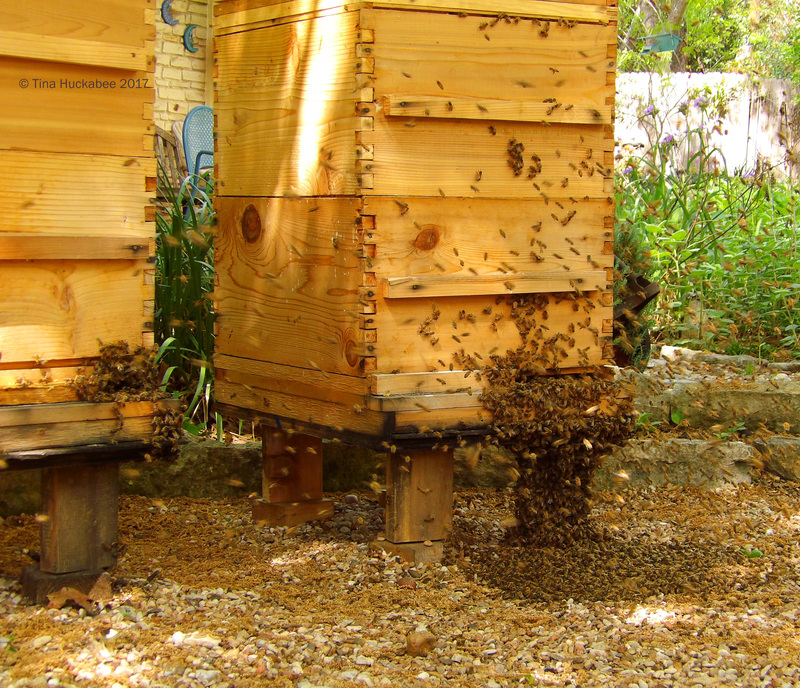 When honeybees swarm, it’s the “old” queen who leaves to establish a new hive. leaving a new queen and some workers, both queens-n-workers ready for honeybee action and hive building. That’s all fine and good, but in our Buzz, the “old” queen is a queen that we purchased last June who is marked (with a white dot for 2016–yearly color markings are an industry standard), and whose wings are clipped. Clipped wings, folks. She can’t fly. So what happened? Did she leave the hive with the worker bees and go into the tree? Or, was it all some sort of honeybee joke? We have some theories, but we don’t really know. 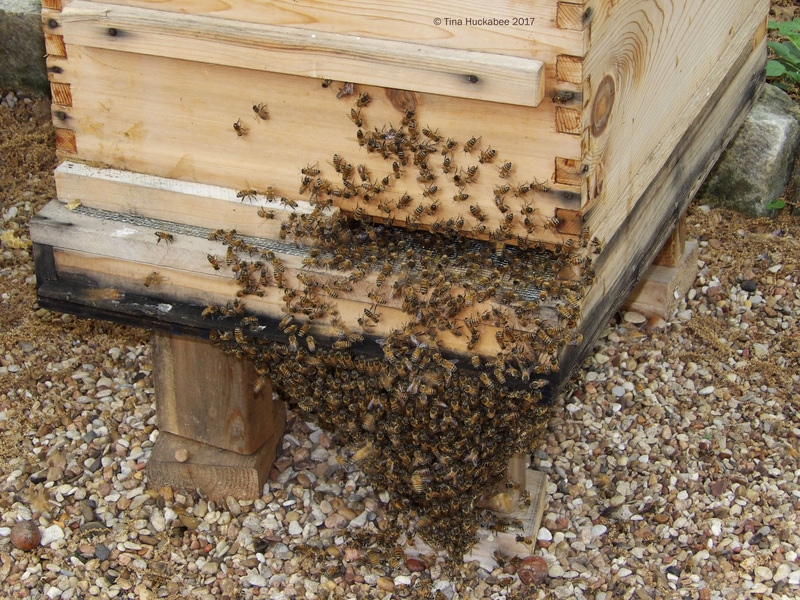 Once queen cells (the normal ones, not the supercedure ones) develop, beekeeper wisdom is that the bees will swarm and there’s nothing that a keeper can do to prevent it. My experience (which is limited) suggests otherwise. We’ve pulled off queen cells before and added space for the honeybees to grow and have avoided the natural process of spring hive swarming. We attempted to do that with Buzz two weeks prior to the non-swarm swarm, but apparently, mis-timed or mis-applied our swarming-fix. So the procreation pheromones revved-up, the bees engorged on honey, and the word in the hive was GO! What happens to a queen who can’t fly off with her workers, the ones that she messaged through her pheromone directive that it’s time to fly the coop? Maybe she waits at the front door, waving at them to come back, or perhaps, she plops off of the landing board and onto the ground, where her attendants surround her. Lots of bees pouring out and onto the ground. And might this be that clump? 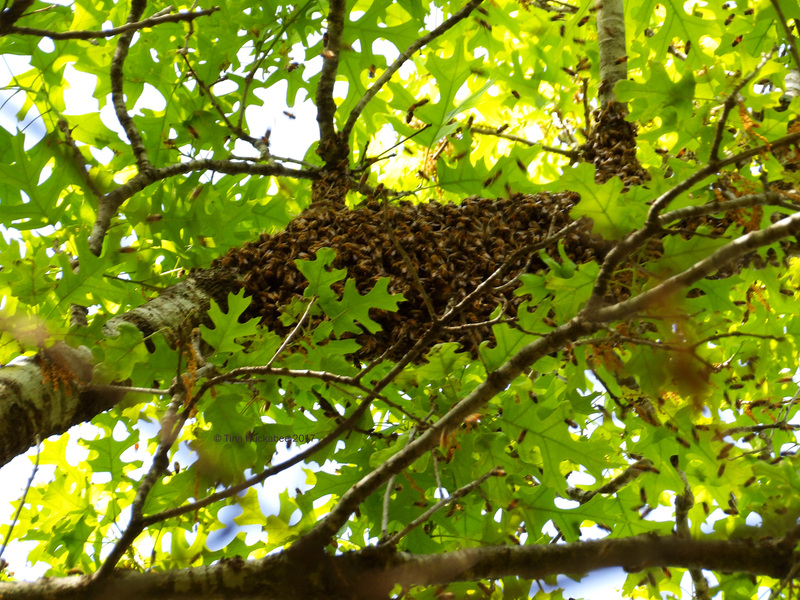 The clump of buzziness was there for the duration of the tree-bound bees, but they crawled back into the hive with the others at the end of the adventure. 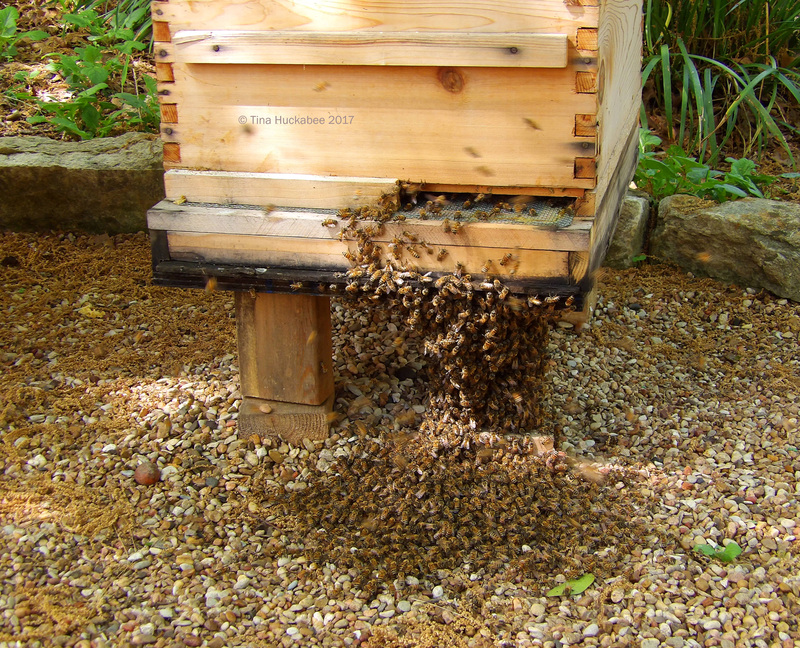 Bees clumping on the ground and near the entrance of the hive. … and fewer still. They’re almost all back into their hive. Do you bring Queen Buzz? No! I thought you had her! I thought Beatrice Bee or Brittany Bee escorted her out! Did we lose her?? Where is she?!! Where’d she go?!! Did one of those dreaded Summer Tanagers eat her? Oh, man–look! She’s still on the ground–what do we do?! No queen on the branch, what’ll we do? BUZZZZZZZZZ! I guess we’d better get back down there, Queen Buzz must have changed her mind. Bummer, I was really looking forward to new digs. And with that community decision, back into the hive they all went–presumably, with their brave, but clipped, queen. What we know is that there was one “old” queen (who can’t leave the hive and who, for whatever reason, wasn’t laying eggs) which is why there were supercedure cells in Buzz. What we saw when we checked a week later, was a brief glimpse of a queen–unmarked and presumably victorious over the others who would have also emerged from the supercedure cells–who disappeared down into her realm of hive frames. Unfortunately, since that event, here as been little-to-no-new brood in Buzz. Obviously, the old queen is kaput and apparently, the new queen is not interested in fulfilling her queen gig–or she’s kaput too. Maybe she just couldn’t find the right guy, or guys. To save this hive, we ordered a new queen who will be delivered in early May. I need to forewarn the new postman. Woody hasn’t swarmed, but like Buzz, apparently had a queen who decided that egg-laying is for the birds after her initial early spring egg-laying frenzy. Fortunately for us, BeeWeaver’s headquarters is in a neighborhood 15 minutes from my house and I was able (with a whining email to an accommodating and kindhearted apiary owner) to acquire a new queen for Woody. With two new, strong queens, both hives should thrive–making bee babies and lots of honey. These honeybees–they’ve produced much drama and no small amount of comedy this spring. 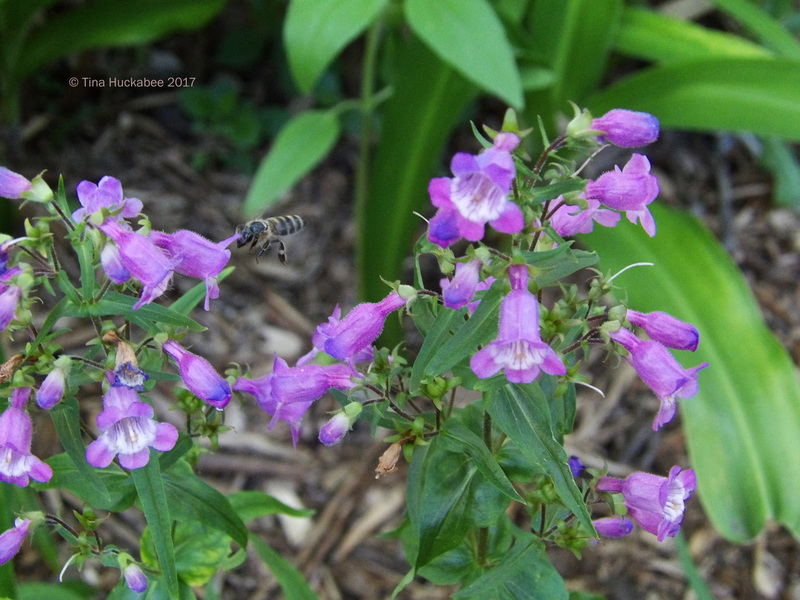 Honeybee forager working a Gulf penstemon bloom. So it is when honeybees share the garden. Sipping water from a birdbath. 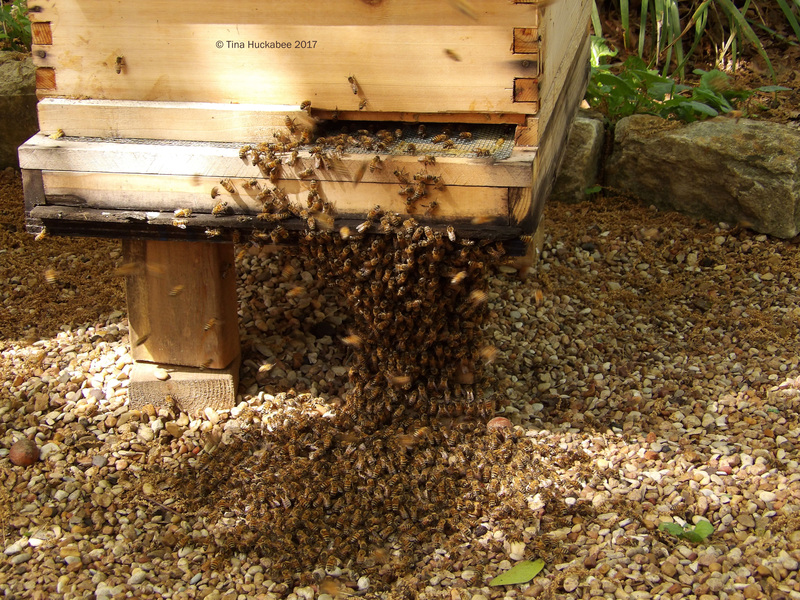 This entry was posted in Backyard beekeeping, Honeybee swarming, Honeybees, Uncategorized by Tina. Bookmark the permalink. Beekeepers are boss! Normally, those clipped wings are a good thing (for the human keepers, anyhow), but a bit problematic if she wants to go, go, go. Does your father live in Oregon? Does he have to feed his bees during winter? We’re contemplating a move there and bees will be part of our gardening picture, so curious about that. No, he actually lives in Sweden. I do know they feed them before they hibernate, but my bee ignorance is glaring. I really should learn more about it – it’s fascinating stuff! Ah, well I suppose that Sweden is at least as cold as Oregon, right? 🙂 I had a conversation some time ago with someone who lives there and she said bees have to be fed, but I didn’t know if that was a consensus opinion. They are interesting, aren’t they? And, you’re most welcome! Really interesting. You were lucky to be there and get photos. Yes, we were actually heading out when I noticed the air full of bees, so we delayed our errand and watched–so glad about the timing. I can’t get over how complicated and interesting this all is. Dare I suggest that your Buzz residents decided at last to move on to Plan Bee? Haha!! You know I have to steal that, right?? Plan Bee-trust me, I’m sure they have others up their wings! Tina go mess with the bees! The Buzz Revolution! It’s a great post with videos and photos. I was very amused by the supposed conversation of the bees in the tree! Now seriously. For me the behavior of the bees has been a fascinating event. I thought that the swarms were dangerous but now I know that they are not and that the bees are the ones that are afraid. But in reality it has not been an enana? Because the Queen has not left and all the bees have returned to their hive alone. The Queen was on the floor? I have no idea of beekeeping, only what I have learned in their post, but I dare say that has been a very rare event. Then the Buzz Hive no longer has a Queen, well she will have a new one in May. And Woody also without Queen, although already has a new one. It’s a shame that a hive runs out of Reina. Let’s see if things get back to normal in Woody and Buzz. Greetings from Margarita. Hi Margarita, yes the bees are fun, though this year it’s been a roller-coaster of activity. 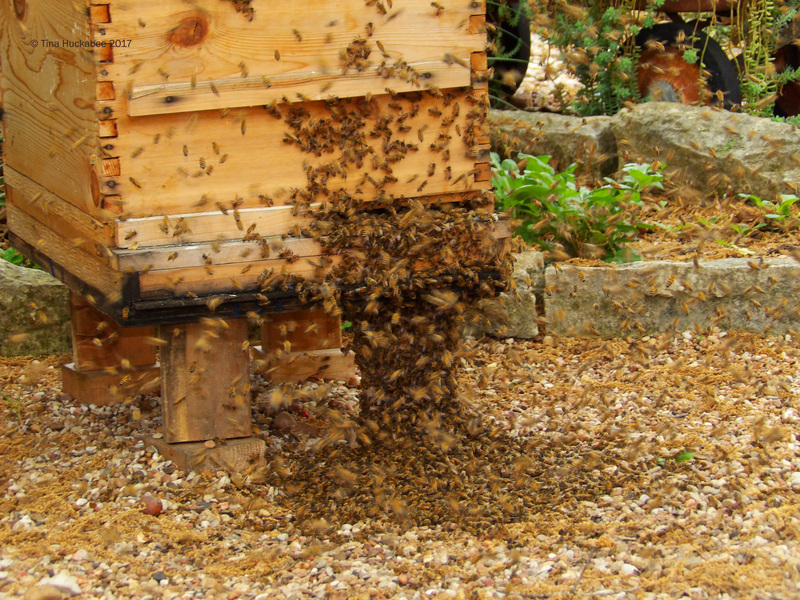 I like your phrase: Buzz Revolution–that describes beekeeping well! No matter what happens to our queens at the beginning of the honeybee season, we can usually purchase a new queen, which many beekeepers do as a matter of practice. We were hoping that our original queens would last through this year. Many thanks Tina for her explanation about the Queen. I’m glad you liked my sentence. Greetings from Margarita. Amazing tale and great pictures. It puts me in mind of one our holidays where we start out for somewhere, but have forgotten something and have to go back! Love the idea of the queen waiting at her front door. Tina, it’s good that we have you to narrate the bee “drama” and “comedy”! Enjoyed it. Glad to oblige, Hollis. I think the bees are providing the drama and the bumfuzzled beekeepers, the comedy. Fascinating stuff. I always learn so much from your posts about your bees. If I were younger, with a little more time, I might consider getting into this hobby. Thanks for the explanation of why you think the swarm happened and the status of your hives. I hope you have a great season! Thanks, Beth. It’s an education with these gals. I don’t really consider myself a “real” beekeeper–the hobby is an adjunct to my garden, but that’s what beekeepers often were, historically. Time commitment varies, but spring is definitely a busier time with an almost weekly commitment of an hour or so on the weekends.